This article is about the device in heraldry. For the American coin, see Double Eagle. In heraldry and vexillology, the double-headed eagle is a charge associated with the concept of Empire. The double-headed eagle motif appears to have its ultimate origin in the Ancient Near East, especially in Hittite iconography. It re-appears in the High Middle Ages, from ca. the 10th or 11th century, and was notably used in the Byzantine Empire, but 11th or 12th century representations are also known from Islamic Spain, France and Bulgaria, and from the 13th century onward it becomes more widespread, and is used in the Seljuk Sultanate of Rum, Mamluk Egypt in the Islamic sphere, and in the Holy Roman Empire, Serbia and Russia in the Christian sphere. Used in the late Byzantine Empire as dynastic emblem of the Palaiologoi, it was adopted during the late medieval to early modern period in the Holy Roman Empire on one hand, and in Orthodox principalities Serbia and Russia on the other, representing an augmentation of the (single-headed) eagle or Aquila associated with the Roman Empire. In Russia, the motif was further augmented to create the triple-headed eagle. After the Bronze Age collapse, there is a gap of more than two millennia before the re-appearance of the double-headed eagle motif. The earliest occurrence in the context of the Byzantine Empire appears to be on a silk brocade dated to the 10th century, which was, however, likely manufactured in Islamic Spain; similarly early examples, from the 10th or 11th century, are from Bulgaria and from France. Double-headed eagles on imperial vestments of Empress Theodora Kantakouzene, from the Golden Bull of Alexios III of Trebizond, mid-14th century. 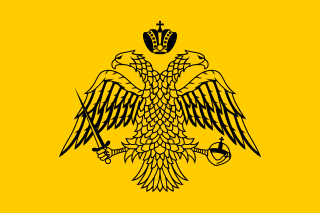 The early Byzantine Empire continued to use the (single-headed) imperial eagle motif. The double-headed eagle appears only in the medieval period, by about the 10th century in Byzantine art, but as an imperial emblem only much later, during the final century of the Palaiologos dynasty. 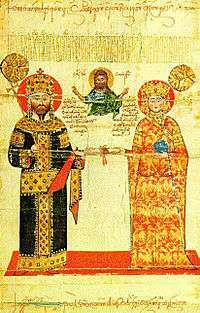 A modern theory, forwarded by Zapheiriou (1947), connected the introduction of the motif to Emperor Isaac I Komnenos (1057–1059), whose family originated in Paphlagonia. 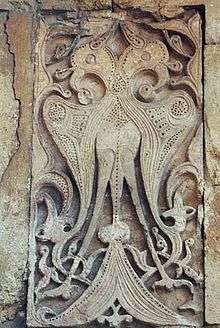 Zapheiriou supposed that the Hittite motif of the double-headed bird, associated with the Paphlagonian city of Gangra (where it was known as Haga, Χάγκα) might have been brought to Byzantium by the Komnenoi. The double-headed eagle motif was adopted in the Seljuk Sultanate of Rûm and the Turkic beyliks of medieval Anatolia in the early 13th century. A royal association of the motif is suggested by its appearance on the keystone of an arch of the citadel built at Ikonion (Konya) under Kayqubad I (r. 1220–1237). The motif also appears on Turkomen coins of this era, notably on coins minted under Artuqid ruler Nasir al-Din Mahmud of Hasankeyf (r. 1200–1222). Later in the 13th century, the motif was also adopted in Mamluk Egypt; it is notably found on the pierced-globe handwarmer made for Mamluk amir Badr al-Din Baysari (c. 1270), and in a stone relief on the walls of the Cairo Citadel. 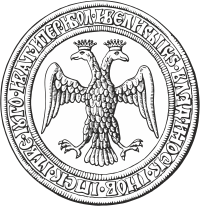 Adoption of the double-headed eagle in Serbia, Russia and in the Holy Roman empire begins still in the medieval period, possibly as early as the 12th century, but widespread use begins after the fall of Constantinople, in the late 15th century. The oldest preserved depiction of a double-headed eagle in Serbia is the one found in the donor portrait of Miroslav of Hum in the Church of St. Peter and Paul in Bijelo Polje, dating to 1190. 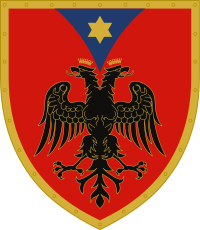 The double-headed eagle in the Serbian royal coat of arms is well attested in the 13th and 14th centuries. An exceptional medieval depiction of a double headed eagle in the west, attributed to Otto IV, is found in a copy of the Chronica Majora of Matthew of Paris (Corpus Christi College, Cambridge, Parker MS 16 fol. 18, 13th century). In Russian principalities, the two-headed eagle symbol is known since time of Jani Beg khan of the Golden Horde (1342–1357), who was actively participating in internal politics of Russian principalities, and was stamping his coins with symbol of two-headed eagle. 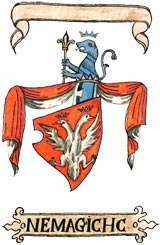 The Nemanjić coat of arms as depicted in the Fojnica Armorial(based on the Ohmućević Armorial, late 16th century). In Serbia, the Nemanjić dynasty adopted a double-headed eagle by the 14th century (recorded by Angelino Dulcert 1339). The double-headed eagle was used in several coats of arms found in the Illyrian Armorials, compiled in the early modern period. 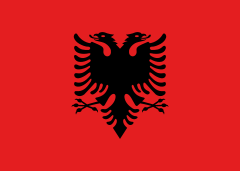 The white double-headed eagle on a red shield was used for the Nemanjić dynasty, and the Despot Stefan Lazarević. A "Nemanjić eagle" was used at the crest of the Hrebeljanović (Lazarević dynasty), while a half-white half-red eagle was used at the crest of the Mrnjavčević. Use of the white eagle was continued by the modern Karađorđević, Obrenović and Petrović-Njegoš ruling houses. After the fall of Byzantium the use of two-headed eagle symbols spread to Grand Duchy of Moscow after Ivan III's second marriage (1472) to Zoe Palaiologina (a niece of the last Byzantine emperor Constantine XI Palaiologos, who reigned 1449-1453), The last prince of Tver, Mikhail III of Tver (1453–1505), was stamping his coins with two-headed eagle symbol. The double-headed eagle remained an important motif in the heraldry of the imperial families of Russia (the House of Romanov (1613-1762). 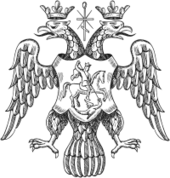 The double-headed eagle was a main element of the coat of arms of the Russian Empire (1721-1917), modified in various ways from the reign of Ivan III (1462–1505) onwards, with the shape of the eagle getting its definite Russian form during the reign of Peter the Great (1682–1725). 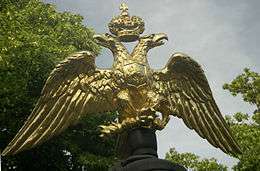 It continued in Russian use until abolished (being identified with Tsarist rule) with the Russian Revolution in 1917; it was restored in 1993 after that year's constitutional crisis and remains in use up to the present, although the eagle charge on the present coat of arms is golden rather than the traditional, imperial black. The Quaternion Eagle of the Holy Roman Empire, c. 1510. Emperor Maximilian with the Imperial Banner (Albrecht Altdorfer, ca. 1515). Use of a double-headed Imperial Eagle, improved from the single-headed imperial eagle used in the high medieval period, becomes current in the 15th to 16th centuries. The double-headed Reichsadler was in the coats of arms of many German cities and aristocratic families in the early modern period. It continued to be used in the family coat of arms of the House of Holstein-Gottorp (1762–1917)) of Austria-Hungary (the House of Habsburg). 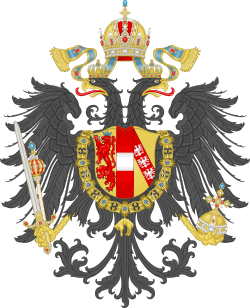 After the dissolution of the Holy Roman Empire in 1806, the double-headed eagle was retained by the Austrian Empire, and served also as the coat of arms of the German Confederation. The Gandaberunda is a bicephalous bird, not necessarily an eagle but very similar in design to the double-headed eagle used in Western heraldry, used as a symbol by the Wadiyar dynasty of the Kingdom of Mysore from the 16th century. Coins (gold pagoda or gadyana) from the rule of Achyuta Deva Raya (reigned 1529–1542) are thought to be the first to use the Gandaberunda on currency. An early instance of the design is found on a sculpture on the roof of the Rameshwara temple in the temple town of Keladi in Shivamogga. The symbol was in continued use by the Maharaja of Mysore into the modern period, and was adopted as the state symbol of the State of Mysore (now Karnataka) after Indian independence. The two-headed eagle appears, often as a supporter, on the modern and historical arms and flags of, Austria-Hungary, the Kingdom of Yugoslavia, Austria (1934–1938), Albania, Armenia, Montenegro, the Russian Federation, Serbia. It was also used as a charge on the Greek coat of arms for a brief period in 1925–1926. It is also used in the municipal arms of a number of cities in Germany, Netherlands and Serbia, the arms and flag of the city and Province of Toledo, Spain, and the arms of the town of Velletri, Italy. An English heraldic tradition, apparently going back to the 17th century, attributes coats of arms with double-headed eagles to the Anglo-Saxon earls of Mercia, Leofwine and Leofric. The design was introduced in a number of British municipal coats of arms in the 20th century, such as the Municipal Borough of Wimbledon in London, the supporters in the coat of arms of the city and burgh of Perth, and hence in that of the district of Perth and Kinross (1975). The motif is also found in a number of British family coats of arms. In Turkey, General Directorate of Security, municipality of Diyarbakır and two football clubs of Turkey, Erzurumspor and Konyaspor, have a double-headed eagle in their coat of arms. The Double-Headed Eagle of Lagash is used as an emblem by the Scottish Rite of Freemasonry. It was introduced in France in the early 1760s as the emblem of the Kadosh degree. The double-headed eagle is the emblem of the Greek sport clubs AEK and (since 1929) P.A.O.K.. It is a symbol of the clubs' origins, since both were founded by Greek refugees who fled to Greece from Constantinople in the 1920s. It is also the emblem of the Turkish Konyaspor and Erzurumspor, the Dutch clubs NEC and Vitesse Arnhem, the English League Two football club AFC Wimbledon and Scottish Premier League side Saint Johnstone FC. ↑ Collins, Billie Jean. 2010 "Animal Mastery in Hittite Art and Texts" in The Master of Animals in Old World Iconography, ed. Derek B. Counts and Bettina Arnold, pp. 59-74. Main Series, Number 24, Archaeolingua Foundation, Budapest. 1 2 Reconstructed by the Abegg Stiftung Riggisberg, Switzerland. P. Ackermann: A Gold-woven Byzantine Silk of the Tenth Century. In: Revue des Arts Asiatiques X, 1936, 87-88. D.G. Sheperd: A mediaeval brocade. In: Bulletin of the Cleveland Museum of Arts 37, 1950, 195-196; S. Müller-Christensen: Zwei Seidengewebe als Zeugnisse der Wechselwirkung von Byzanz und Islam. In: Artes Minores. Dank an Werner Abegg. Bern, 1973, 22-25. ↑ Stone slab with Double-Headed Eagle, Stara Zagora, Nasionalen Arkheologicheski Muzei, Sofia Inv. nr.B: 854; 10th-11th century, from the time of the Macedonian Empire in Bulgaria (976-1018) or from the time of Byzantine occupation (971-976; 1018-1185) and may be the emblem of rank of the Bulgarian tsar/basileus in Illyricum. Evans, Helen C. & William D. Wixom. Eds. The Glory of Byzantium. Art and Culture of the Middle Byzantine Era A.D. 843-1261. The Metropolitan Museum of Art, New York, 1997. 326f. ↑ Miniature of the Archangel Michael (killing a devil) and a monk, with a two-headed eagle between the arches, ms. of Pseudo-saint Clément, Recognitiones; Mont Saint-Michel, c. 1000. Avranches, Bibliothèque Municipale ms. 50. ↑ Zapheiriou, N. (1947). Η ελληνική σημαία από την αρχαιότητα ως σήμερα ("The Greek Flag from Antiquity to present"). Athens, Greece. pp. 21–22. . "Ο φωτισμένος αυτός Αυτοκράτορας καταγόταν από Οίκο της Παφλαγονίας, όπου στην πόλη Γάγγρα υπήρχε ο θρύλος της ύπαρξης φτερωτού αετόμορφου και δικέφαλου θηρίου (γνωστού ως Χάγκα), το οποίο και κοσμούσε το θυρεό του κτήματος της οικογένειάς του στην Καστάμονη." It is unclear where Zapheiriou's term Haga (Χάγκα) is taken from; it does not appear to find further reflection in scholarly literature but it was adopted by historical fiction author Gordon Doherty in his Strategos: Island in the Storm (2014), see note on p. 390: "One theory is that the symbol was adopted from the many ancient Hittite rock carvings of the mythical Haga found throughout Anatolia." ↑ "It was from the Byzantines, however, that the Turks adopted the double-headed eagle. A royal association with this emblem is suggested by its appearance on the keystone of an arch from the Seljuk citadel at Ikonion. This is made even more explicit by the double-headed eagle emblazoned with the word al-Sultan on a ceramic tile excavated at the palace of Alaeddin Kaykubad at Kubadabad, near Akşehir" Helen C. Evans, William D. Wixom, The Glory of Byzantium: Art and Culture of the Middle Byzantine Era, A.D. 843–1261, Metropolitan Museum of Art (1997), p. 411. ↑ "Artuqids of Mardin, Nasir al-Din Mahmud (1200 - 1222 AD), AE Dirhem 26 mm; minted AH 617 (1220/1221 AD) obv: Two-headed eagle. Rev: Three line Kufic legend in beaded border" Tom Buggey, Coins of Islam. "B2272. ARTUQUIDS OF HISN KAYFA AND AMID, NASIR AL-DIN-MAHMUD, 1200-1222 AD. AE Dirhem, Spengler/Sayles 15. 12.68 gm. Two headed eagle with wings spread representing the astrological sign Gemini/Legend. Nice VF." Edgar L. Owen, TURKOMAN AND OTHER EARLY WORLD COINS. Baldwin Islamic Coin Auction 18 nos. 626–629. ↑ Mamlūk Studies Review, Volume 8, p. 64. ↑ Pierced Globe (Handwarmer made for Badr al-Din Baysari) c.1270 London: British Museum 78 12-30 682. ↑ The Cairo Citadel relief is of uncertain origin, and was likely moved to Cairo during the Mamluk period. Nasser Rabbat, "The Visual Milieu of the Counter-Crusade in Syria and Egypt" in: Khalil I. Semaan (ed. ), The Crusades: Other Experiences, Alternate Perspectives: Selected Proceedings from the 32nd Annual CEMERS Conference (2003), p. 76. Its heads are missing, and its design is the origin of the (single-headed) "Eagle of Saladin" introduced as a symbol of Egyptian Republicanism in the 1950s. L. A. Meyer, Saracenic Heraldry (1933), p. 195, cited after The Flag Bulletin 24 (1985), p. 44. ↑ Atlagić, Marko (2009). "Određivanje nacionalnih heraldičkih simbola na primjeru Srba i Hrvata [Étude des symboles nationaux héraldiques à l' exemple des Serbes et des Croates]" (PDF). Zbornik radova Filozofskog fakulteta u Prištini, no. 39, pp. 179–188. ↑ Alfred Znamierowski (2003). Illustrated book of Flags. London: Southwater - Annes Publishing Ltd. p. 55. ISBN 1-84215-881-3. ↑ Eleni Kokkonis-Lambropoulos & Katerina Korres-Zografos (1997). 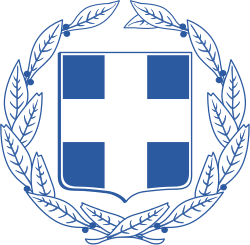 Greek flags, arms and insignia (Ελληνικές Σημαίες, Σήματα-Εμβλήματα) (in Greek). E. Kokkonis-G. Tsiveriotis. pp. 47, 51. ISBN 960-7795-01-6. ↑ A. Davidson, A history of the Holtes of Aston, baronets (1854), p. 69, in a description an armorial frieze dated 1608. ↑ "Civic Heraldry, Wimbledon Borough Council". Retrieved 30 May 2015. 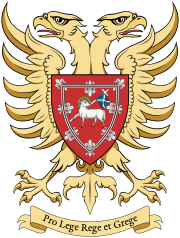 ↑ "Perth and Kinross - Coat of arms". ngw.nl - Heraldry of the World. Retrieved 11 October 2013. ↑ Alfred William W. Morant, An alphabetical dictionary of coats of arms belonging to families in Great Britain and Ireland (1874), p. 304. ↑ "History". PAOK F.C. Retrieved 11 October 2013. ↑ "Mercian History". Mercian Volunteers Regimental Association. Archived from the original on 2007-09-29. Retrieved 2013-05-13. ↑ Urquhart, R. M. (1973). Scottish Burgh and County Heraldry. London: Heraldry Today. pp. 108–109. ISBN 0900455241. Soloviev, A.V. (1935). "Les emblèmes héraldiques de Byzance et les Slaves". Seminarium Kondakovianum (in French). 7: 119–164. Wikimedia Commons has media related to Double-headed eagles.